A solar panel can be your only source of power in remote areas. 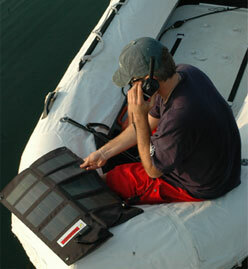 Solar power devices use the energy of the sunlight to charge batteries of satellite phones and other equipment where no electrical outlet is available. IMPORTANT: When ordering a solar panel, make sure you possess or order a car charger for your satellite phone or equipment. It is needed to connect the phone to a solar panel.